Rooster Pressure Monitor | Degree Controls, Inc. The Rooster™ Pressure100 is a next-generation air pressure and temperature monitor with a user-friendly touchscreen interface for configuring alarm set points and output behavior. 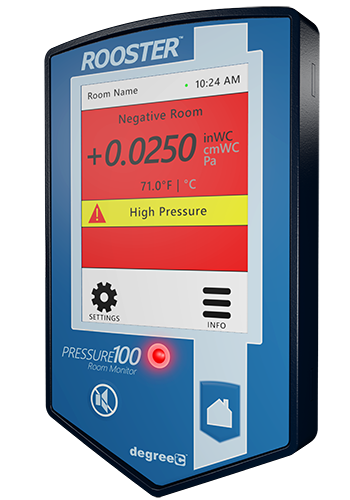 The Rooster™ Pressure100 is designed to meet the monitoring guidelines for USP 797 and FDA 503b in clean rooms, laboratories, vivariums, hospitals, and critical containment facilities. Air pressure and temperature readings are displayed on an intuitive LCD touchscreen interface. 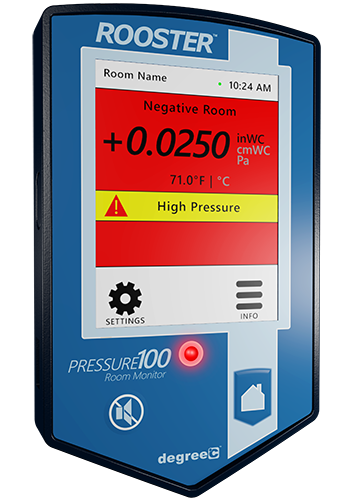 With the Rooster Pressure100, real-time fluctuations in pressure or temperature are flagged with background screen color shifts to indicate changes in safety status based on user-defined thresholds. Active alarms are augmented with a flashing red LED. Built for laboratory professionals, the LCD touchscreen interface of the Rooster™ Pressure100­ works with or without gloves. Call for lead time information.